Costa Rica’s 111-kilometer long Tarcoles River is one of the most polluted water bodies in Latin America. Plastic and paper litters the brown water’s edge and is embedded in the muddy banks. When seasonal floodwaters recede, ribbons of trash demarcate high water points. Sewage from interior cities and towns drains into the river. It is a horrible place to swim. But if you are a crocodile the warm, nutrient-rich water are a feeding bonanza. Dozens of American crocodiles line the riverbanks sunbathing in statue-like stillness. Others ply the water for a meal, their nostrils and unblinking eyes the only hint of the killing machine below. With an estimated 25 crocodiles per square kilometer, the river has one of the highest croc populations in the world. Most people would not see Tarcoles River as a potential tourism attraction, but where others saw lemons, one man saw an opportunity for lemonade. Dr. Mario F. Orjuela, a veterinarian from Columbia who specialized in crocodiles, iguanas, snakes and toads, was struck by the area’s richness on his first visit in 1993. “While undertaking survey expeditions and night excursions, I began thinking of a way to show this hidden treasure to visitors, to let them know in an educative way about the fascinating creatures and the ecosystem of this tropical paradise. And so the ‘Jungle Crocodile Safari’ was born,” he once said. 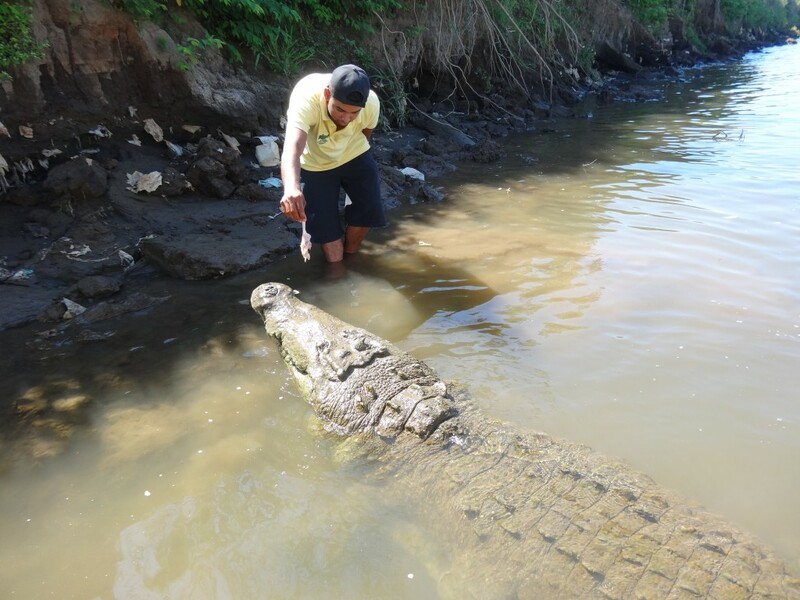 Orjuela died several years ago – a victim of crime, not crocodiles- but his company lives on. Over 6,000 people come from around the world each year to see these muscular river juggernauts. Two-hour tours on covered boats with open sides allow unobstructed views of 100- plus bird species and the main event, crocodile feeding. Tyson didn’t seem to mind the tail handling and lay with an unblinking stare that could mean either ‘I’m full’ or “you look like my next meal”. Andrey left the safety of the boat and stepped into the chocolate-colored mud a meter from Tyson’s head with a kilogram of raw chicken in his hand. Realizing a bad day on my job was never as grim as a good day for a crocodile guide, Andrey proceeded to swat 300 kilograms of wild crocodile on the nose with raw meat. Crocodiles are capable of great speed bursts and I wondered how Andrey knew if the croc would be satisfied with the chicken or go for the whole enchilada. Tyson didn’t appear interested in the free meal so Andrey readjusted his position, moving slowly to avoid losing his footing on the slippery bank, before hitting the croc harder. Tyson’s jaws opened, shutters clicked in rapid staccato, and the chicken disappeared. Andrey jumped back in the boat. “Is this a well-paying job?” I asked, thinking the risk of losing a limb would be well compensated, but apparently not. “If I want to support a family, I will need to get another job,’ he replied. 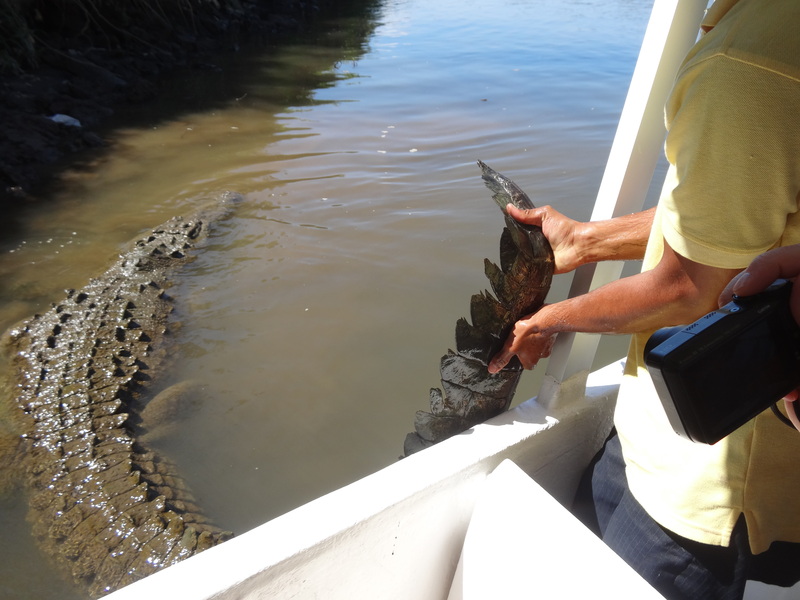 While Tarcoles River still looked polluted to me, the signs advertising crocodile tours scattered through Tarcoles town indicated Dr. Orjuela’s vision had been realized. 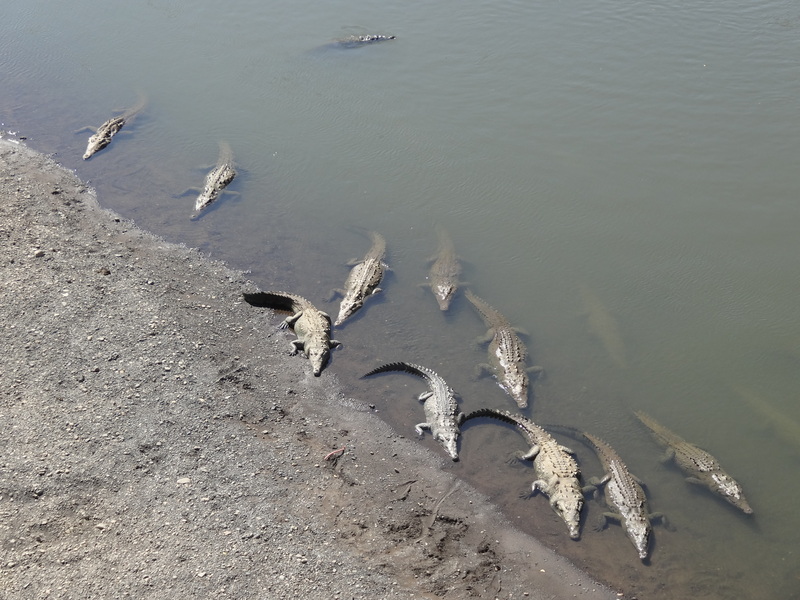 Visitors are seeing the biotic richness of the Tarcoles River and locals are seeing richness from crocodiles and the tourism dollars they bring. 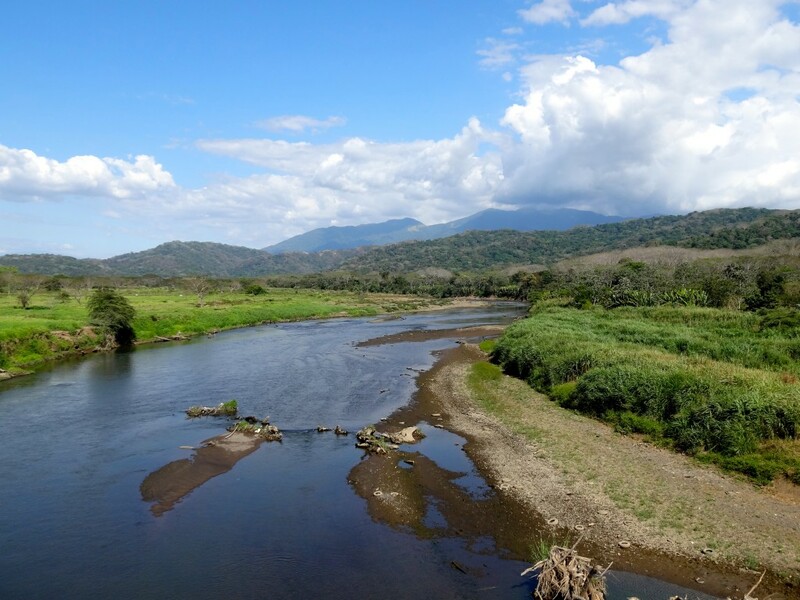 Costa Rica’s 111-kilometer long Tarcoles River is one of the most polluted water bodies in Latin America. Plastic and paper litters the brown water’s edge and is embedded in the muddy banks. When seasonal floodwaters recede, ribbons of trash demarcate high water points. Sewage from interior cities and towns also drain into the river. It is a horrible place to swim. Most people would not see Tarcoles River as a potential tourism attraction, but where others saw lemons, one man saw an opportunity for lemonade. Dr. Mario F. Orjuela, a veterinarian from Columbia who specialized in crocodiles, iguanas, snakes and toads, was struck by the area’s richness on his first visit in 1993. “While undertaking survey expeditions and night excursions, I began thinking of a way to show this hidden treasure to visitors, to let them know in an educative way about the fascinating creatures and the ecosystem of this tropical paradise. And so the ‘Jungle Crocodile Safari’ was born,” he said. Dr. Orjuela died several years ago – a victim of crime, not crocodiles- but his company lives on. Over 6,000 people come from around the world each year to see these muscular river juggernauts. Two-hour tours on covered boats with open sides allow unobstructed views of 100+ bird species and the main event, crocodile feeding. Tyson didn’t seem to mind the tail handling and lay with an unblinking stare that could mean either ‘I’m full’ or “you look like my next meal”. Andrey left the safety of the boat and stepped into the chocolate-colored mud a meter from Tyson’s head with a kilogram of raw chicken in his hand. Realizing a bad day on my job was never as grim as a good day for a crocodile guide, Andrey proceeded to swat 300 kilograms of wild crocodile on the nose with raw meat. Crocodiles are capable of great speed bursts and I wondered how Andrey knew if the croc would be satisfied with the chicken or go for the whole enchilada. Tyson didn’t appear interested in the free meal so Andrey readjusted his position, moving slowly to avoid losing his footing on the slippery bank, before hitting the croc harder. Tyson’s jaws opened, shutters clicked in rapid staccato, and the chicken disappeared. Andrey jumped back in the boat. “Is this a well-paying job?” I asked, thinking the risk of losing a limb would be well compensated, but apparently not. “If I want to support a family, I will need to get another job,’ he replied. While Tarcoles River still looked polluted to me, the signs advertising crocodile tours scattered through Tarcoles town indicated Dr. Orjuela’s vision had been realized. Visitors are seeing the biotic richness of the Tarcoles River and locals are seeing richness from crocodiles and the tourism dollars they bring. An excellent example of turning lemons into crocodile-style lemonade! The ultimate in turning lemons into lemonade via @Reinventure – Click to Tweet. Find out how one of the most polluted water bodies in Latin America has turned into a tourist attraction: Click to Tweet. Discover why visitors are now seeing the biotic richness of the Tarcoles Rivers instead of the pollution: Click to Tweet.